Crown lengthening is a minor gum surgery that has a number indications. One of the most important indications is when inadequate tooth structure is available to make an artificial cap (In order to have a stable cap that dose not come off, it is important to provide proper retention and resistance form, which basically means adequate height and proper tooth preparation. (This part is purely rules of Physics). 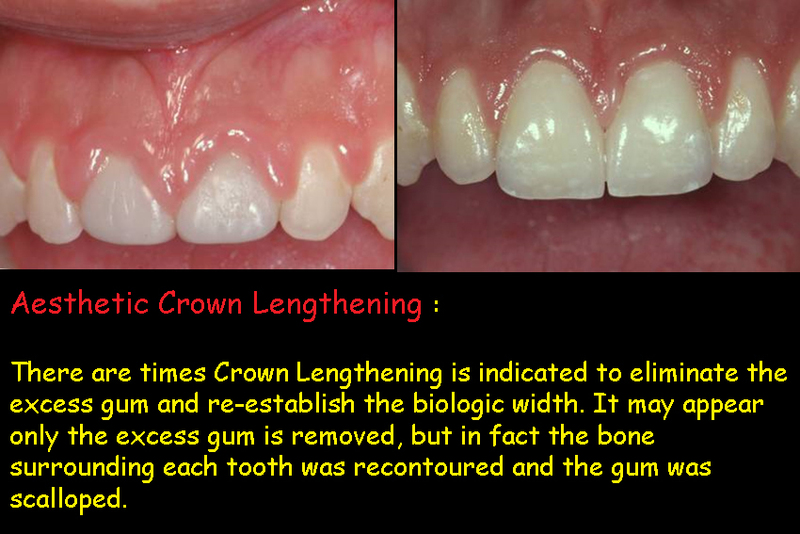 Crown lengthening is re-contouring of “the bone” around the tooth/teeth and removal or re-positioning of gum (depending how much thick gum is present), in order to expose more tooth structure and increases the length of the clinical tooth crown, it is not merely removing the gum! It is important that the artificial crown surrounds the tooth structure ( not build up material) 360 degrees, while there is at least 2-3 mm height. In dental terminology we call it Ferrule Effect. It is the most important factor for the success of a root canal treated tooth. 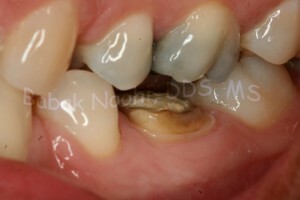 The Photo above demonstrates the outcome of a root canal treated tooth that has lost its cap. Lack of sufficient tooth structure (Ferrule Effect) is evident which contributed to the loss of the cap. I offered the patient to expose more tooth structure by performing ” Crown Lengthening” in order to save the tooth and prevent extraction ( Photo on the Right side). It is a Safe and proven procedure to save teeth from extraction or prevent them from future complications, when it is indicated and appropriately performed. There are other indications for Crown Lengthening too. Another important indication is when the decay extends fairly below the gum, and it is too close to the bone between the teeth (Click here). 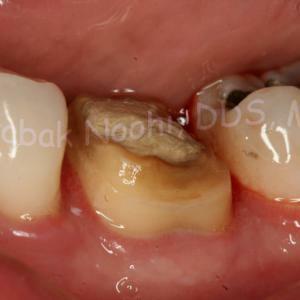 There should be at least 2-3 millimeters space between the margin of a restoration (a Crown or a Filling) and the bone. In dental terminology this distance is called, “biologic width“. If biologic width is violated (meaning the restoration is too close to the bone); a chronic inflammation is guaranteed. Inflammation will lead to bone loss, which gradually leads to periodontal pocket formation and constant presence of plaque & Biofilm. Bacteria in the plaque causes decay/cavity on the root surface under the gum on the one hand and on the other deepening of the periodontal pocket leads to further bone loss. Loss of bone means, loosing support and weakening the tooth. Weak tooth will eventually loosen and the tooth will be lost. Crown Lengthening can also be done to improve the aesthetics of a smile (Click Here) when there is uneven gums surrounding teeth. Below are some examples. 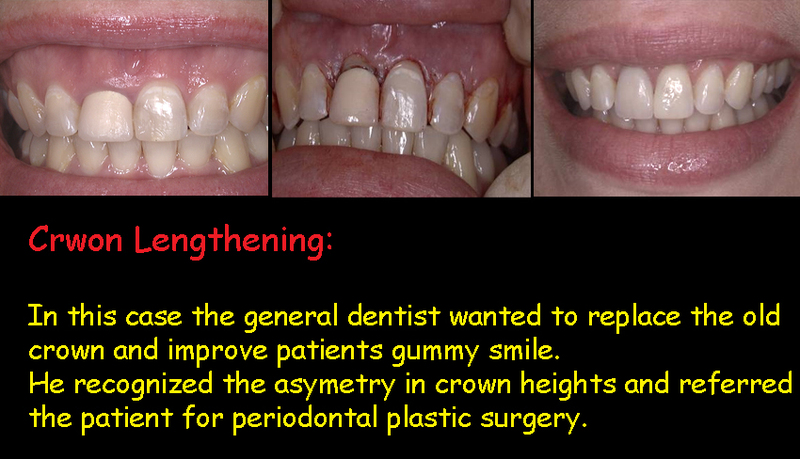 If you like to read more about Crown Lengthening and see more photos of different clinical cases, you can click HERE. If you have a crown that comes off from time to time, or have a broken tooth that needs extraction, Talk to your Prosthodontist and find out if you are a candidate for Crown Lengthening, your tooth may be saved. I just saved a tooth today for a patient who was referred for Extraction. She was so happy that I could saved it. She said to me, “Dr. Noohi! Saving my tooth was your New Year Present to me”.